Perfect for Titan Swap Applications! These bolt on wheel spacers are designed to give you a little more width without changing out your axle for a wider one. Bolt pattern is 6 stud on a 4.5" round circle. Made from Billet 6061-T6 aluminum. 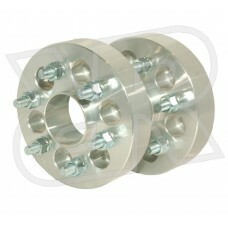 Shipped as a set of 2 spacers w/nuts.